Be the first to share your favorite memory, photo or story of Lida. This memorial page is dedicated for family, friends and future generations to celebrate the life of their loved one. 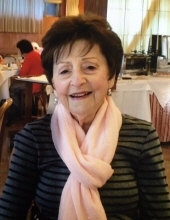 Lida Jenny Berridge of Broomfield, Colorado, passed away on March 18, 2019, at the age of 88. Born on June 22, 1930, in San Francisco, California, to Luigi Casella and Ada Rossi Casella, who emigrated from Italy to the US in the early 1920s, she met her future husband, Robert (Bob) Berridge (1930-1997) on a Northern California beach in 1951, while Bob was on leave from the army. They were married on September 14, 1952 and established their first home in Daly City, CA. She gave birth to two daughters in 1955 and 1957. She and Bob moved their young family to a warmer climate in Cupertino, CA, in 1961. By 2005, both daughters resided in Colorado, and in 2007, Lida sold the family home and moved to Colorado, to be closer to her daughters and two younger granddaughters. She was a devoted wife, mother, and grandmother, who loved to cook, bake, clean, shop, travel, and always look her best. In her later years, she enjoyed being part of the Healthy Heart walkers at Paul Derda Rec Ctr. Prior to having children, Lida worked for Bank of America. She returned to work at Hewlett Packard after her girls were grown. Upon retirement, she worked part-time for Ave Maria Bookstore in Cupertino and was active as a greeter at St. Joseph’s of Cupertino Catholic Church. Her smile and her laughter were infectious. She is survived by her two daughters, Donna Mazzitelli and her husband, Dominic, and Debbie Silver and her husband, Steven; three granddaughters; and four great-grandchildren. A visitation will be held in the care of Rundus Funeral Home at 12114 Grant Circle, Thornton, CO 80241 on Monday, March 25, 2019 from 4:00 to 6:00 p.m. Graveside services will be held at Gate of Heaven Cemetery, 22555 Cristo Rey Drive, Los Altos, CA 94024, on Monday, April 1, 2019 at 11:00 a.m., Lida’s final resting place with her husband, Bob, who predeceased her on May 10, 1997. In lieu of flowers, please make a donation in her memory to the American Heart Association or a charity of your choosing. To plant a tree in memory of Lida Jenny Berridge, please visit our Tribute Store. "Email Address" would like to share the life celebration of Lida Jenny Berridge. Click on the "link" to go to share a favorite memory or leave a condolence message for the family.